Keeping a backup either for export or as a Timeline/Activity Progression may be necessary for some organisations. This simple tutorial will provide a guideline on how to create a Backup XML of your Cloudlet. You will need to first login to your Cloudlet via the Cloudlet Manager. 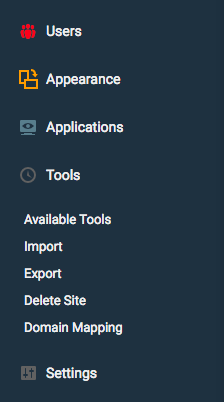 Once logged in and you have selected to Manage your Cloudlet, select “Tools” on your Administrator Backend Menu, as shown below. It’s your content; you can do whatever you like with it. The content will be delivered as a series of XML files, which will contain your posts, pages, comments, categories, tags, and references to your site’s media files. If you’d like to export all of your content, select the “All Content” radio icon. If you’d like to export a subset (a single author’s posts, for example, or a certain category or date range), click the radio icon next to the Posts or Pages button to see the advanced options.